PROVERBS 13:20 KJV "He that walketh with wise [men] shall be wise: but a companion of fools shall be destroyed." 17A wicked messenger falleth into mischief: but a faithful ambassador is health. 18Poverty and shame shall be to him that refuseth instruction: but he that regardeth reproof shall be honoured. 19The desire accomplished is sweet to the soul: but it is abomination to fools to depart from evil. 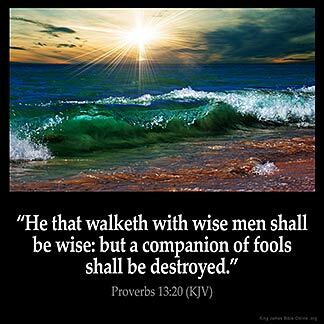 20He that walketh with wise men shall be wise: but a companion of fools shall be destroyed. 21Evil pursueth sinners: but to the righteous good shall be repayed. 22A good man leaveth an inheritance to his children's children: and the wealth of the sinner is laid up for the just. 23Much food is in the tillage of the poor: but there is that is destroyed for want of judgment. He that walketh with wise men, shall be wise: but a companion of fooles shall be destroyed. Go with wise men and be wise: but he who keeps company with the foolish will be broken. One who walks with wise men grows wise, but a companion of fools suffers harm. He that walketh with wise men shall be wise; but the companion of fools shall smart for it. The people who stays on wise teachings keeping them in their lives without pretendind, God will bless them with wisdom,but those who follow the foolish teachings will be vanished and never live anymore even we are together with. Solomon was the wisest man in his time at the end , he was a fool For he took on many strange wives and they knew not his our God and they led him into worshiping idols !!! A fool is one that says 'NO ' to God It is my prayer daily to walk after the commandments of my Lord and Saviour . When God 's people hang around the unbelievers it will have an effect on our walk with God and not for the good !! I must be sensitive to God 's leadership. Young or old, if we do not choose our friends and associates wisely, that is, by the good standards from the Bible, we can expect that we will fare badly. i find it to be true..